Ontario has been overrun by Black Bears. In the last ten years, Black Bear numbers have doubled or even tripled in some areas. Some say it's from a combination of milder winters, absence of spring hunting and better-managed forestry. 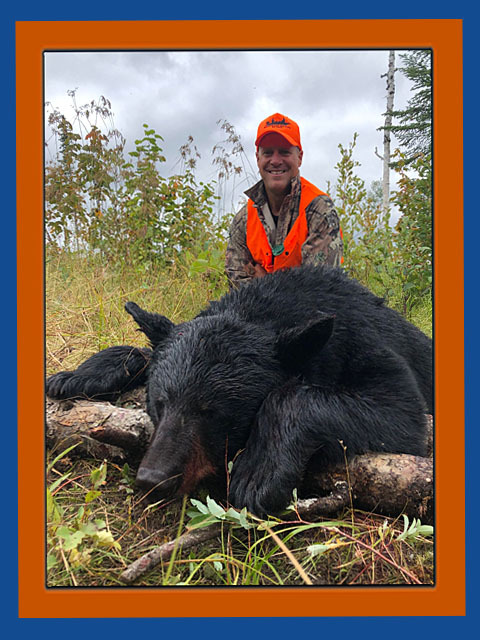 What really matters is there are more bears and a greater availability of really big Trophy Black Bears, which is the main factor in the success of your hunt. The terrain in our BMA (Bear Management Area) is ideal for Black Bears to prosper. Overgrowth of softwood and grasses, logged areas and natural clear areas are all prime areas where Raspberries grow in great abundance. The many rocky outcroppings of Canadian Shield Rock covered with mosses are prime areas for Blueberries to grow. These fruits are very important for a balanced diet that the bears need from the time they are cubs until they reach maturity in order to be healthy, strong and grow big. Their diets are also supplemented with the high amounts of small game in the area. Since the fall of the fur trade, the beaver population is way up and they are easy prey for bears, thus meat is always available. The high population of Whitetail Deer and Moose also makes the bear's predation successful. The bears will take Moose calves and fawns when ever available. As a result of the availability of food, our hunting guests have the potential to harvest some of the biggest Black Bears in Ontario. 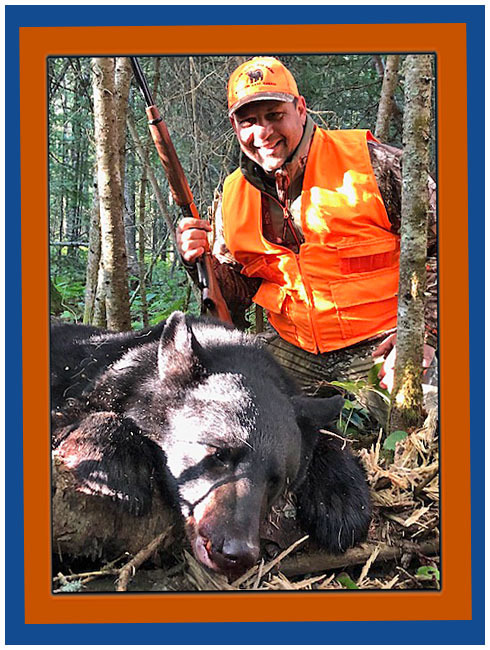 Bears that big are not available in most places in Ontario and we don't want you to think every guest gets the opportunity to harvest a 500-pound Black Bear but we do want you to know there is a chance. 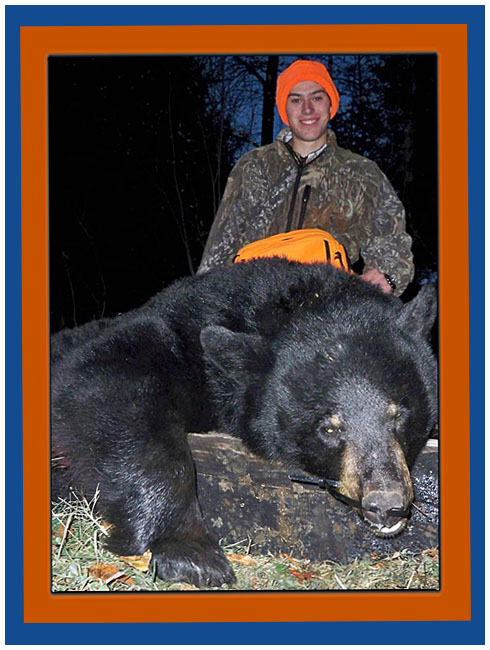 Having that chance builds anticipation, which makes your bear hunt very exciting! We are responsible for managing a two bear management areas (BMAs) are about 300 square kilometers. Baiting bears from such vast surroundings will lure great numbers of bears to our stands and that will give our hunting guests a very high success rate. We limit the number of hunters per season. This enables us to give your hunt a more personal touch and maximize your success. All baits are active weeks prior to our hunter's arrival and we will discuss in detail with each hunter the patterns and habits of each bait site. 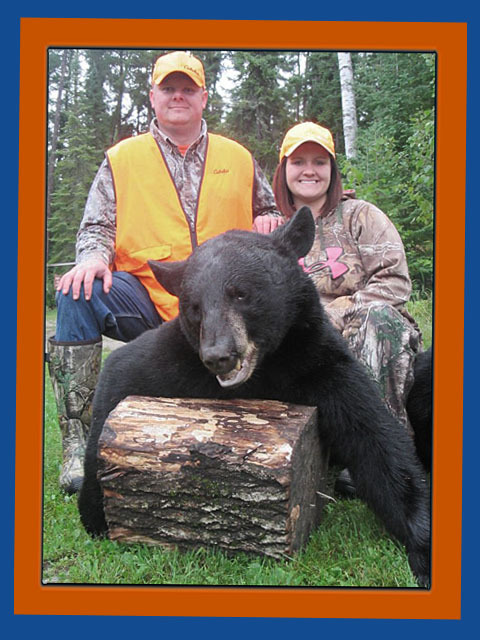 Bear Hunting Dates: The non-resident bear season starts August 15 every year and runs until October 15th. free wireless internet throughout camp & courtesy computer in the lodge for guests over 16 yrs old or children supervised by an adult. Ladder stands & platform stands will be at each site, but if you desire you may bring your own. $1,725.00 CDN + 13% HST Per Person Per Week. Deposits for Bear Hunt : $800.00 per person within 15 days of booking and Payment in full by June 1st. All deposits are non-refundable but are transferable. Deluxe boats with live-wells, flat floors, comfy pedestal seats, depth finder and large casting platform at the bow. Life jackets, minnow/leech bucket, landing net, anchor, paddles & safety kit. Up to 100 litres of gas for the boat included. Friendly courteous staff on the dock to assist you from daylight until dark daily. Free lake tour for first time guests. Please note: the above pricing is based on 2 or 3 persons per rental boat. If you wish to use your own boat the price is the same but the gas allowance, bait and docking are included. $1,945.00 CDN + 13% HST Per Person Per Week.